I’ve been thinking a lot about my Aunt Vi. She passed away 2 days ago at the beautiful age of 98. I am unable to be with my family for the funeral so I thought I might remember Aunt Vi here. Violet May (her maiden name) was my grandmother’s younger sister, my dad’s aunt. Vi was born in Tulsa, Oklahoma. Both she and my grandmother were women with all the poise and grace of women of the south. They were always well put together. They were beautiful. They were loving and generous and strong. They definitely each had the longevity genes! 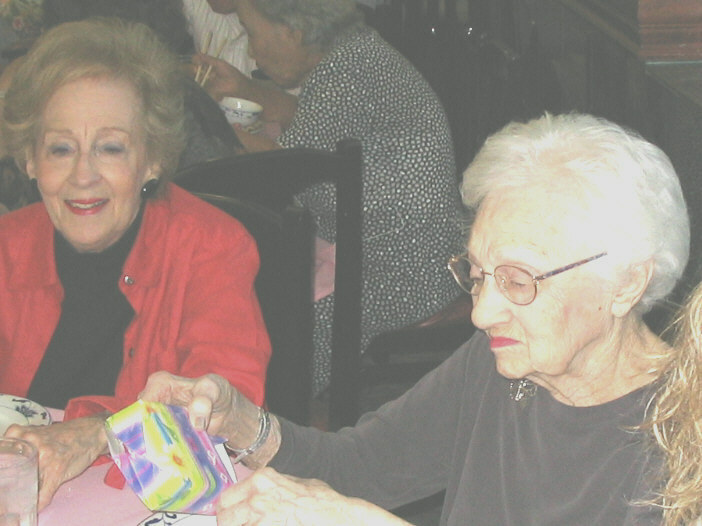 Here’s a picture of them at my grandmother Ruth Novak’s 95th birthday in 2004. Aunt Vi is on the left, Nanny Ruth on the right. Violet in particular was a woman of great strength. Vi loved and lost 4 husbands. Perry Rowe was her first love. Perry and she created a family together and raised them in Los Angeles, 2 daughters and son. Perry passed away in his 60’s, the day of the Watts riots in Los Angeles in 1965. Dan Bennett was her next love. I remember visiting Vi and Dan in their home in Palm Dessert. Ruben Cheir was a retired physician. Her final love was Ben Tuch, a retired obstetrician. Some might think that Aunt Vi was a woman who was afraid to be alone. But that isn’t the case. Vi was a woman who had much love to give and share. She loved having her family and loved being with family. She was dedicated to her children, grand children, great grandchildren, nieces, nephews, great nieces and nephews and even great-great nieces and nephews. These candlesticks were my grandparents – Grandma and Grandpa May. They gave them to me (I felt truly honored) and I am giving them to you to carry through the May family heritage. I know you both will treasure them and say many blessings over them. You know, these candles are a gift to you in honor of your both becoming rabbis. Its appropriate now that you are settling into your first home that they will bless your home, and you will have a place for them. I am so proud of you both and love you very much. Aunt Vi was right. These candle sticks do bless our home. They come out on special family occasions, such as the bris of our younger son in 1997. (That’s my grandmother Nanny Ruth there, right after having lit the candles. They belonged to her grandmother too. Our younger son was named after his great-grandfather, Ruth and Violet’s father). 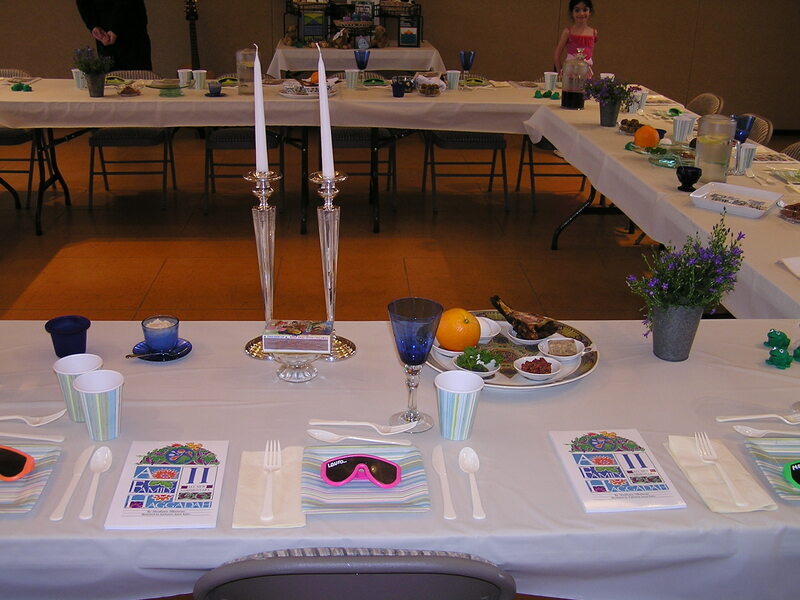 We take them out for Passover seder and other Jewish holidays. And someday, they will pass onto one of our sons and his family to bless their home. I think about what it took for my great-great grandparents to bring these candlesticks with them from the old country (the Ukraine) when they emigrated to Oklahoma back in the 1880’s. I think about the many Shabbatot and Jewish holidays that were welcomed with the lighting of candles in these candlesticks. I think about the family whose faces were lit up by the light of these candles. All engraved in these candlesticks that will stay with us for generations more. Aunt Vi, we will remember you always. May you rest in peace. A BEAUTIFUL AND LOVING TRIBUTE TO A WONDERFUL WOMAN AND A LIFE WELL LIVED. LOVE TO YOU ALL FROM YOUR OKLAHOMA COUSIN MIKE. I’m sorry for the loss of your aunt Vi, but what a wonderful, loving legacy she has left to you and your family. May your memories of her always be sweet (as they clearly are) and may her light continue to shine through you and the candles in her candlesticks.